HAPPY NEW YEAR ! ! from LilacsNDreams ! ! Hello everyone! I have missed all of you, and my blog this past week. I want to apologize to everyone, and let you know that you have not been forgotten. On Christmas Day due to complications my Father was air lifted to the hospital, in ICU, and I have been there since then. Last night...Sunday....we just got home to take care of things. I had to come by here to let you all know I was thinking of you, and my blog/site, and hoping all of you had a wonderful Christmas too! Here is to a New Year, new plans, new goals, and wishing the best to everyone! Have you set some new goals for 2013? You are so welcome to share with us here your ideas, and thoughts. Please be safe, have fun, and enjoy the bringing in of the new year everyone. Take care, and see you again soon at LilacsNDreams! 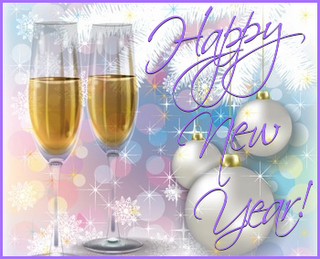 HAPPY NEW YEAR . . . . 2013 ! ! !